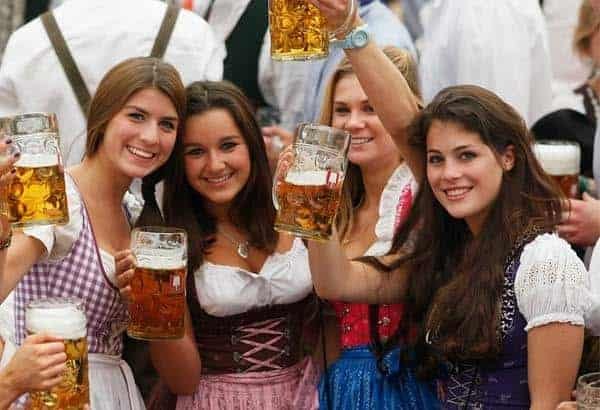 MORE than six million people are expected to turn up at Oktoberfest this year, decked out in dirndls (tradition smock-like dresses) and lederhosen, ready to slurp down litre-sized steins of frothy beer served up with soft, doughy pretzels and Bratwurst. The style of the 14 large, and 20 small, tents is largely consistent — filled with rows of wooden benches, flags and bunting decorating the roofs, and a brass band belting out traditional drinking songs as a soundtrack to the clinking glasses and dull roar of a well-fed, well-watered crowd. Reservations can be made at each individual tent, provided you buy beer and food coupons in advance. For those without reservations, coveted spaces fill up quickly and it’s best to get there before 3pm on weekdays and before 10am on weekends. To help narrow down your choices, we’ve got the lowdown on some of the tents available. The Oktoberfest website tells us “Americans and Australians feel especially happy here” in ‘world-famous’ Hofbraeuhaus. 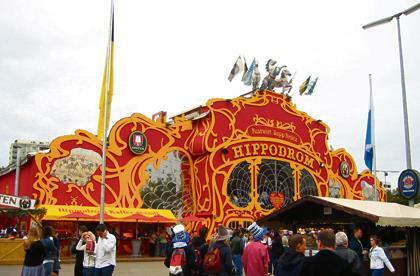 This energetic, welcoming tent is known for being popular with tourists, attracting groups of Australians looking to fully embrace the Oktoberfest spirit. 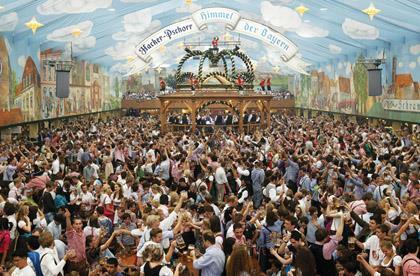 With room for 6,896 Australians, that’s a lot of Oktoberfest energy to go around. The one where the celebrities hangout. That is, if you want to hang out with Boris Becker and Hayden Panettiere. Frequented by a younger crowd, and with a sparkling wine bar for those who are feeling a bit beer-heavy, it’s a fun, ‘flirty’ (their words!) place to party. At 3,200 capacity, it’s smaller than the other large tents so get in early. Around since 1895, ArmbrustschÃ¼tzen is one of the more traditional tents with classic Bavarian music and great food. The name also means “crossbow shooting” in English — and there are still marksmen shooting competitions to entertain guests in the tent. Wash down all the Paulaner beer with delicious pork knuckles, bratwurst or grilled chicken. At capacity of 5,830, it’s big enough to have the atmosphere but not so big as to lose your table on the way back from the bathroom. Not a tent, but a two storied, timbered house. Compared to the biggest tent of the festival, Schottenhamel (seating capacity 10,000), Zur Bratwurst might feel like stepping inside an exclusive club. With only 170 seats, it offers a cosy, charming atmosphere and a house speciality of fried sausages — grilled over an open beech wood fire. 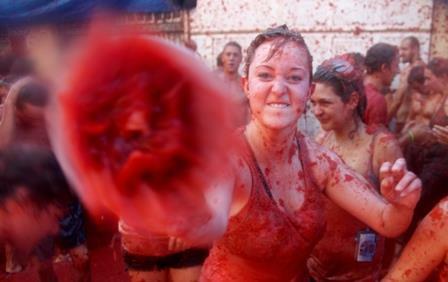 Sick of sausage? Bored of beer? Bodo’s Café Tent (at 10 years old, it’s relatively new on the Oktoberfest scene) offers up delicious pastry specialities and snacks, with coffee served from a collectors mug you can take home. Bodo’s is cosy and family-oriented, but there are still a great range of beers, cocktails and other drinks available and a live-band from 7pm. What tents have you visited at Oktoberfest and which one is your favourite?